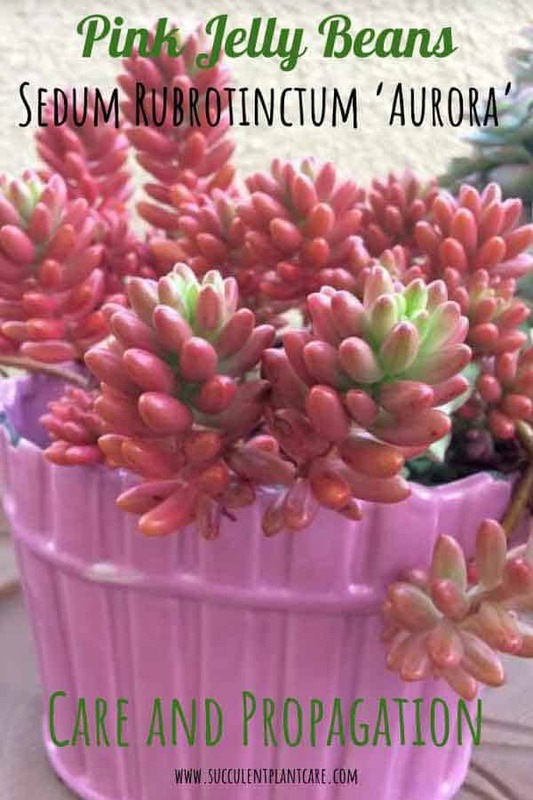 If you love Sedum Rubrotinctum ‘Jelly Bean Plant’ then you would equally love Sedum Rubrotinctum ‘Aurora’ – commonly referred to as Pink Jelly Beans or Pink Pork and Beans. These are special plants that have exquisite color combinations and intricate features. They have plump, luscious jelly bean leaves in stunning shades of mauve-pink, cream and lime green. According to Altman Plants, its given name ‘Aurora’ refers to the incredible light show seen around the magnetic poles of the northern and southern hemispheres, also known as the Aurora Borealis (Northern lights) and Aurora Australis (Southern lights). Sedum Rubrotinctum ‘Aurora’ has a garden origin, meaning it has been cultivated from the wild and selectively bred to be grown in the garden. Wherever it came from and whatever name you choose to call it by, we can agree that these are exceptional succulent plants. I started with a small starter plant in a 2-3 inch pot that I have grown and spread in different pots and containers in my garden. These plants sprawl out as they grow and can be grown in ground, in containers or even in hanging baskets. They produce bright clusters of yellow flowers. Sedum Rubrotinctum ‘Aurora’ needs plenty of bright sunlight but not full sun. They do best in areas that receive partial sun or filtered light. 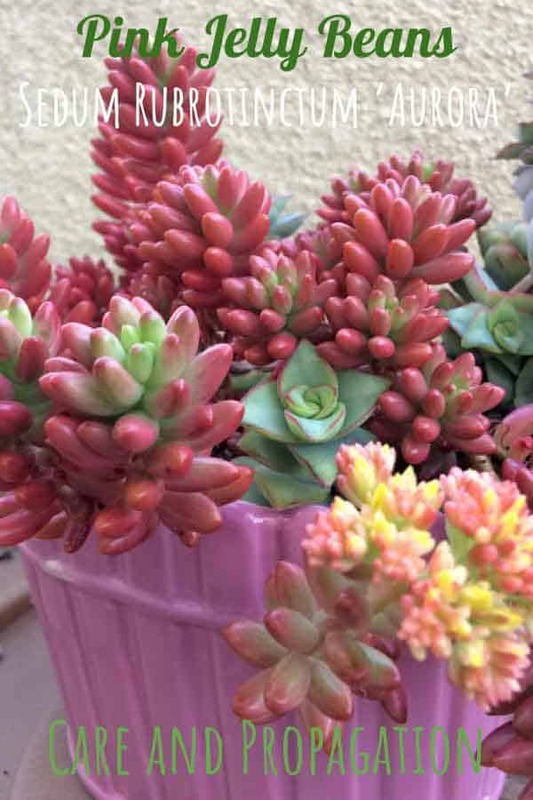 Unlike Sedum Rubrotinctum which can be acclimated to full sun, ‘Auroras’ have a harder time acclimating to full sun or intense heat and burn easier because of their lighter pigmentation. Sedum Rubrotinctum ‘Aurora’ can be grown both indoors and outdoors. Whether indoors or outdoors, providing the right potting mix (a well draining one) along with proper lighting will give them the best chance at survival. If kept indoors, provide as much light as possible. Typically speaking, they need approximately 4-6 hours of light per day to thrive. If left next to a window, the plant can burn under intense unfiltered light. If this happens, move the plant a few inches away from the window or increase shade. You may need to move the plant around until you find the best spot for it. If you live in an area that does not receive adequate light indoors or if you have poor lighting, you may notice your plant stretching out or elongating. This process is called etiolation, wherein the plant does not receive adequate lighting for prolonged periods of time and begins to stretch out seeking for more light. This weakens the plant and does not promote healthy growth. If this is the case you need to move the plant to a brighter location. For poor lighting conditions, consider using a growlight. Growlights are a good investment to have especially if you you have long, dark winters or if your area does not receive enough sunlight. Here are some of my growlight recommendations. Place in a bright sunny location outdoors. Before moving the plant outdoors or increasing the amount of sunlight it receives, it is better to acclimate the plant to prevent sunburn. Slowly increase the amount of light the plant receives to get it acclimated to the more intense light. This will help prevent sunburn or sun damage. Sedum Rubrotinctum ‘Aurora’ is not as adept in handling full sun or intense heat as its counterpart, Sedum Rubrotinctum. Morning sunlight is usually preferred as well as partial shade or filtered afternoon light. During the hot summer months or a heatwave, move the plant to a shadier location to prevent sun damage. Or you can provide sun protection or shade. Sunshades are a real lifesaver for my plants during the intense summer heat here in Northern California where the sun can really scorch the plants if left unprotected. Here are some of my recommendations for sunshades and sun protection. While Sedum Rubrotinctum ‘Auroras’ can tolerate mild frost and even freezing temperatures, they are not meant to withstand extreme winter conditions. Where I live here in Northern California, we have mild winters so I keep most of my plants outdoors and they do fine even with mild frost and freezing rains. However we do get plenty of sunshine during the day, which helps save my plants. For climates with harsh winters, it is best to keep them in containers so you can bring them indoors if frost is expected or before winter sets in. If planted in ground or if you can’t move the plant indoors, provide protection from freezing temperatures using frost cloths and greenhouses. These frost cloths can save your plants and protect them from the long, harsh winter months. Here are some of my frost protection recommendations. I have written a post solely dedicated to “Optimal Temperatures For Succulents to Survive and Thrive”. Click on my post for additional information on this topic. 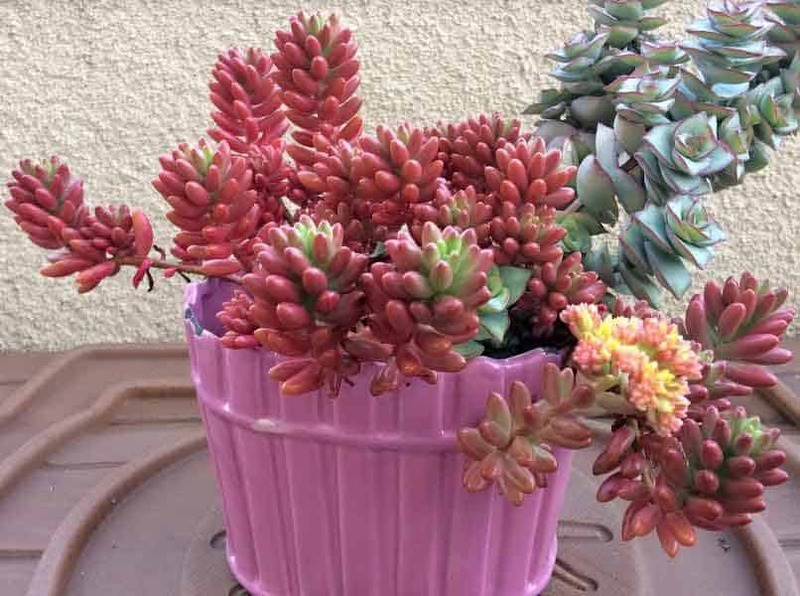 When it comes to soil requirements, Sedum Rubrotinctums ‘Auroras’ are no different from other succulent plants. They need a well draining soil. Wet soil for long periods of time will promote root rot. What has worked well for my plants is a combination of cactus potting mix and perlite for added drainage. I like this combination mainly because it is easy to do, convenient, and it works. I do not use exact measurements but eyeball it to about 2:1 solution of cactus mix and perlite. Others recommend using a sandy soil. This can be achieved by mixing cactus mix or potting soil with coarse sand (about 2:1 ratio). I get most of my materials from a local hardware store. To find some of these materials online click on my resource page for helpful recommendations. To find out more about soil for succulents, I have posted a helpful article called “Best Soil and Fertilizers for Succulents”. Please visit the post when you get a chance. How and when to water is greatly dictated by the climate you live in. 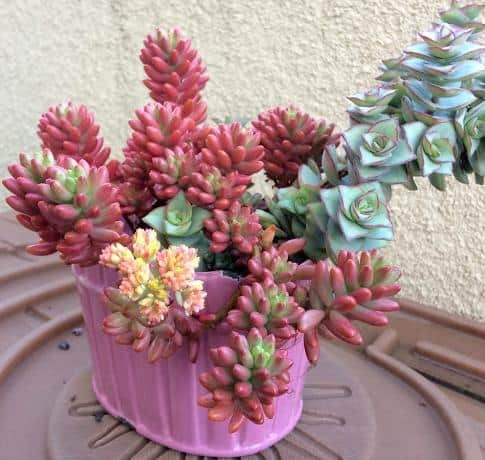 Unfortunately, there isn’t a set schedule or a magic formula on when to water succulents. I live in a very dry climate so my watering schedule is adapted to the dry conditions of my environment. 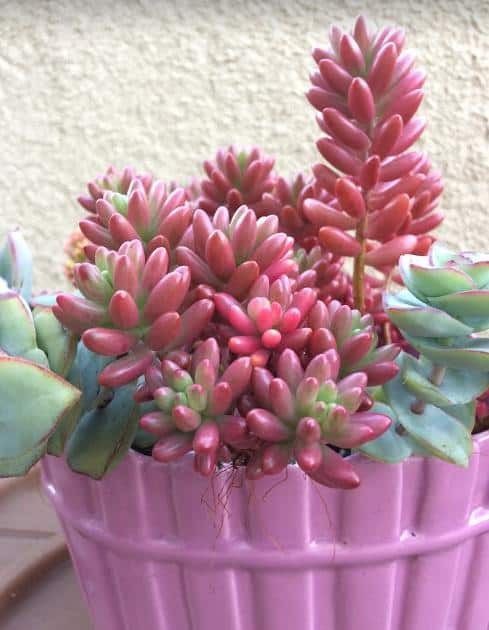 In the summer months, I water my Pink Jelly Beans every 7-10 days, sometimes more during a heatwave, giving the plant a good drink. I cut back on watering to about 10-14 days when the weather cools down in the spring and fall. If you live in a humid location, you won’t need to water as much. During winter season, I mostly rely on rainwater and hold back on watering altogether because this is when we get a lot of rain in my area. But if we don’t get any rain at all during winter then I water at least once a month or every 2-3 weeks, depending on how dry the soil gets. One good way to tell whether it’s time to water is to check the moisture of the soil. The top inch of the soil needs to feel dry before you can water again. If you are unsure how much and how often to water in the beginning, it’s always better to underwater and increase watering as needed. Pay attention to how your plant looks and you can adjust watering accordingly. I tend to underwater my succulent plants than overwater. The best way to tell whether your Pink Jelly Beans are over or underwatered is by paying attention to how the leaves look. The easiest way to tell if your plant is underwatered is when the leaves start shriveling and lose their plumpness. When this happens, it is usually a sign that the plant is running low on its water storage and it is time to water. If this is the case, give the plant a good drink and it should perk up within a day or so. Remember, it is easier to ‘fix’ an underwatered plant than an overwatered one. As long as it is not severe, an underwatered plant will recover almost immediately. When the plant starts looking unhealthy, becomes soft and mushy, drops leaves at the slightest touch, these are telltale signs that you are overwatering your Pink Jelly Bean Plant. 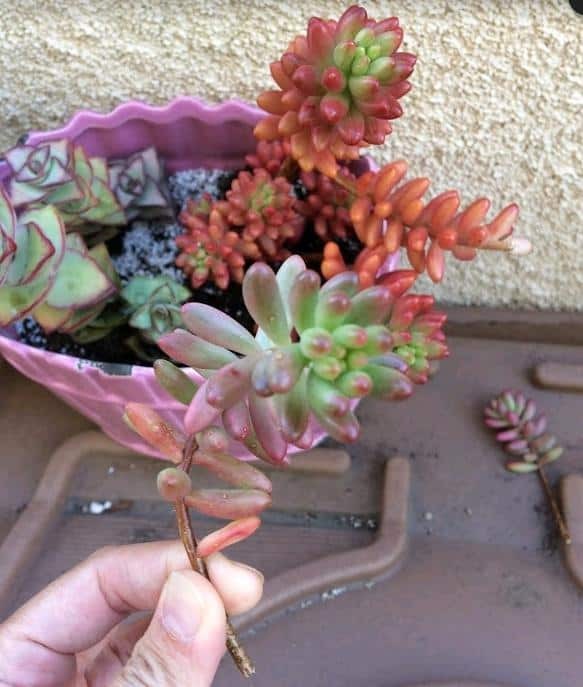 These plants have storage capacities in their stems and leaves and if you overwater them, the leaves swell up and can literally burst from too much water. If this is the case with your plant, there is still hope. The first thing you need to do is to stop watering your plant. Give it a chance to dry out and the plant will usually bounce back. If the soil is not drying out fast enough and stays wet for long periods of time, it is a good idea to repot the plant in a well draining potting mix. If the plant does not recover from overwatering and starts to rot, you can still save the plant by removing it from the wet soil, remove any dead or rotten parts, save any green parts or viable parts and let them dry out for a few days then propagate and repot in a well draining potting mix. Why Do They Drop Leaves? 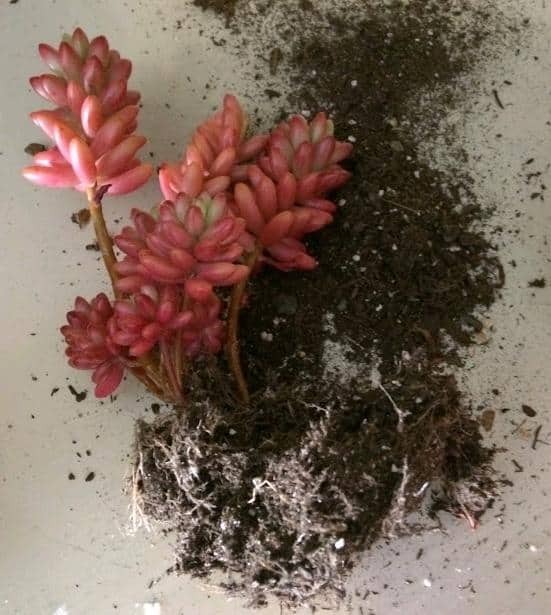 Leaves from Pink Jelly Bean Plants tend to be fragile and can fall off easily during transport or when repotting. This is natural and is expected so do not need be alarmed if you lose a few leaves this way. But if you notice an alarming amount of leaves falling off, to the point where half of the leaves are gone, it is usually a sign that the plant is under stress. 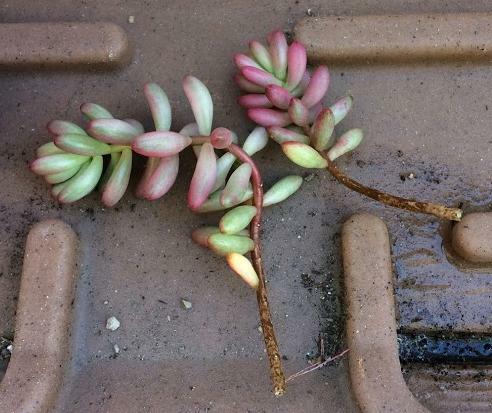 The most common reason for Pink Jelly Beans to drop their leaves is a problem with watering, either under or over watering. An underwatered plant will shed their leaves as a defense mechanism to conserve water storage. Usually when this happens you will also notice shriveled and dried up leaves on the bottom. This means you are not watering your plant enough and it is time to water the plant. Be careful not to overcompensate by overwatering. Just give the plant a good drink of water and increase frequency of watering to suit your plant’s needs. If you need further help with watering techniques, consider using tools like hygrometers or moisture meters to check for moisture in the soil and air. These tools are pretty affordable and can come in handy especially if you are unsure of when to water your plant next. Do check out these tools if you need help in gauging your watering needs by clicking on my resource page. Sedum Rubrotinctum ‘Auroras’ can be propagated from leaf or stem cuttings. Both methods are easy and you can expect a high success rate from both. My preferred route is stem cuttings because I find it easier, faster and fool proof. Leaf propagation is just as easy with these plants but the wait is much longer. And with leaf propagation, no matter what you do you tend to lose some leaves during the process. That’s why it’s a good idea to start off with a few leaves because not all will survive. Here are pictures from some of my stem cutting projects. Prepare a suitable well-draining potting mix. Stick the stem cuttings in soil. You can either stick the leaves in soil or lay them flat on the soil. Increase sunlight as the plant matures and becomes more established. Propagating Sedum Rubrotinctum ‘Aurora’ plants is not complicated. All you need is a little time and patience and soon you will have them growing everywhere. Sedum Rubrotinctum ‘Auroras’ produce bright yellow flowers from mid-spring to summer. These bright yellow flowers provide a nice contrast to the pastel shades of the plant. It is truly a treat to see these plants bloom. Keep in mind that not all plants are ready to flower or will bloom at all. A lot of it depends on environmental factors beyond our control. 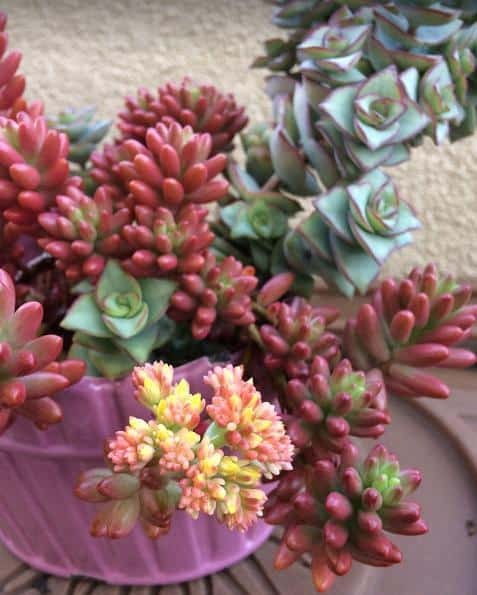 There is not much information on the toxicity of Sedum Rubrotinctum ‘Aurora’ to pets. It is generally known as safe and non-toxic to pets. You may visit the ASPCA website for more information on plant toxicity and symptoms. If you suspect poisoning, contact your local veterinarian immediately or the ASPCA Animal Poison Control Center at 888-426-4435. 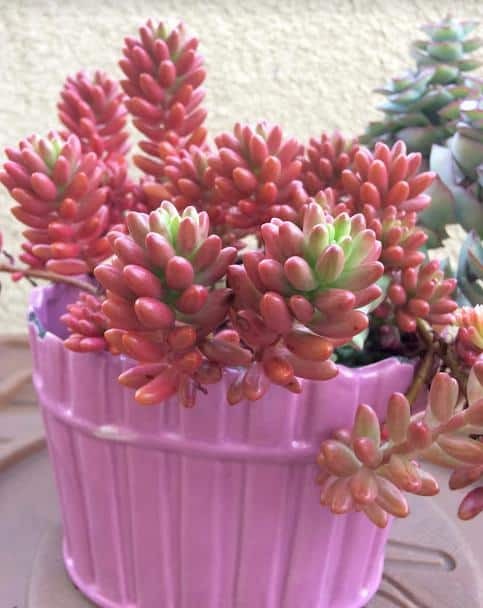 Where can you find Sedum Rubrotinctum ‘Aurora’ (Pink Jelly Beans)’? Check out my resource page for recommendations on where to purchase these and other succulent plants online.